In this video, BJJ Champion Valdir Rodrigues from the EVOLVE Fight Team demonstrates 5 submissions from half guard. In this video, BJJ World Championship Silver Medalist Thaigo Kozama from the EVOLVE Fight Team demonstrates how to do a kimura from the mount position. In this video, BJJ Champion Valdir Rodrigues from the EVOLVE Fight Team demonstrates 3 different ways to take an opponents back from the bottom half guard position. Multiple-time BJJ World Champion Abraao Falcao from the EVOLVE Fight Team demonstrates 5 submissions from side control using the lapel. The worm guard is one of modern Jiu-Jitsu’s most popular positions. It involves utilizing an opponents lapel and wrapping it around your own shin. In this video, BJJ Champion Valdir Rodrigues from the EVOLVE Fight Team demonstrates 5 sweeps from from worm guard. BJJ Champion Fabio Da Mata from the EVOLVE Fight Team demonstrates 5 drills that you can do alone to warm up and increase your agility for Brazilian Jiu-Jitsu. BJJ Champion Fabio Di Mata from the EVOLVE Fight Team demonstrates 5 different chokes from turtle position in Brazilian Jiu-Jitsu. BJJ Champion Vitor Ribeiro from the EVOLVE Fight Team demonstrates how to take an opponents back from the closed guard position. 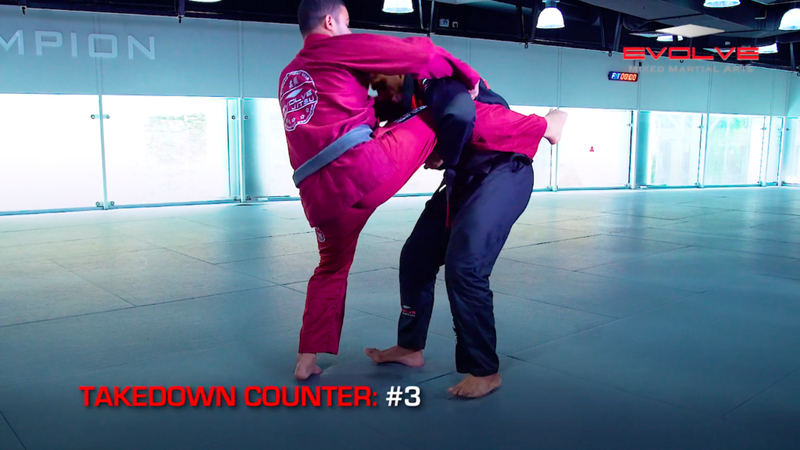 BJJ Champion Valdir Rodrigues from the EVOLVE Fight Team demonstrates 5 ways to defend and counter a takedown. In this video, BJJ World Champion Jucimar Eller from the EVOLVE Fight Team demonstrates his 3 favourite shoulder lock submissions. BJJ is one of the world’s most effective disciplines for self defense. Although it is not comprehensive, there are many great techniques from BJJ that can cross over into real world self defense. In this video, BJJ No-Gi World Champion Takeo Tani teaches a self defense technique adapted from BJJ. Leg locks are some of the most devastating submissions in BJJ. The knee bar is the quintessential leg lock submission, and it can be secured from both the top and bottom position. In this video, BJJ No-Gi World Champion Takeo Tani teaches a knee bar submission from the closed guard. The triangle lock is one of the most effective submissions in BJJ. It is a very versatile submission that can be applied from a wide range of positions. In this video, BJJ champion Almiro Barros teaches five of his favourite variations on the triangle lock.